Great Starter Home! Great location in PRP Area. 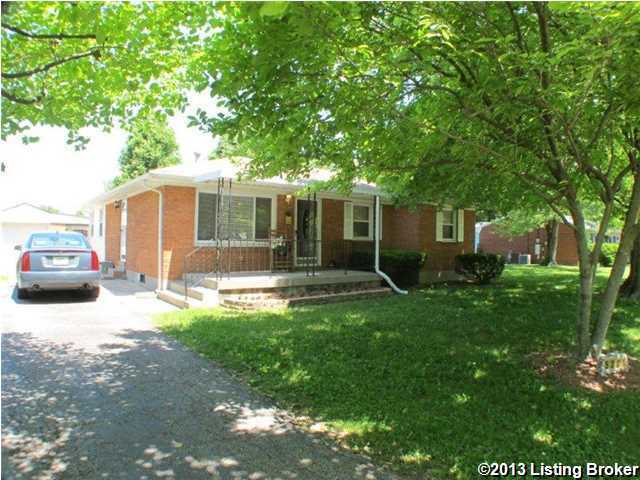 3 Bedroom, 1 Bath, Brick Ranch with detached 1.5 car Garage and covered patio. Covered front porch. Lots of updates - windows, electric service, newer kitchen and newer flooring throughout. Fenced back yard that backs up to the elementary school. An added family room gives this lovely home the true feeling of home. Call the listing agent for your personal showing today. Maryman Acres is a subdivision within the city of Louisville, Kentucky. There are currently 0 Homes for Sale within Maryman Acres, with asking prices ranging from $0 to $0. The average list price per square foot of the available inventory in Maryman Acres is $0, which is the Louisville average of $152. Recent comparable homes have been selling for 94.17% of their asking price. Waterfront homes represent of the available Maryman Acres inventory. The population of Louisville, according to the 2010 Census, is 597,337. The total number of households in the zip code of Maryman Acres is 10,405, with an average household size for of 2.54 people. The total number of renter households within the zip code of 40258 is 2,376, which means that 77.16% of households in this zipcode are owner occupant households. 5301 Pyrus Ln, Louisville KY 40258 is a Home, with 3 bedrooms which is recently sold, it has 1,249 sqft, 0 sized lot, and 1 Car Garage,Detached parking. A comparable Other, has bedrooms and 0 baths, it was built in and is located at and for sale by its owner at $ 0. This home is located in the city of , in zip code , this County Other, it is in the Subdivision, and Sylvania are nearby neighborhoods.